Range map of the rough-skinned newt, by Don Garlick. Herpetology, the study of amphibians and reptiles, sheds much light on the nature of evolution. Consider the range of body plans and lifestyles among salamanders (amphibians with tails). They commonly hatch from eggs in water or moist places, though a few species give birth to live young. Some are confined to water and use external gills. Some metamorphose into land crawlers and breathe with lungs. Surprisingly, most require neither gills nor lungs, but exchange gases through moist skin and mouth membranes. A local lungless species has such small legs that it resembles a tiny snake. The nine-inch Pacific Giant Salamander devours banana slugs. A Japanese salamander is almost six feet long. 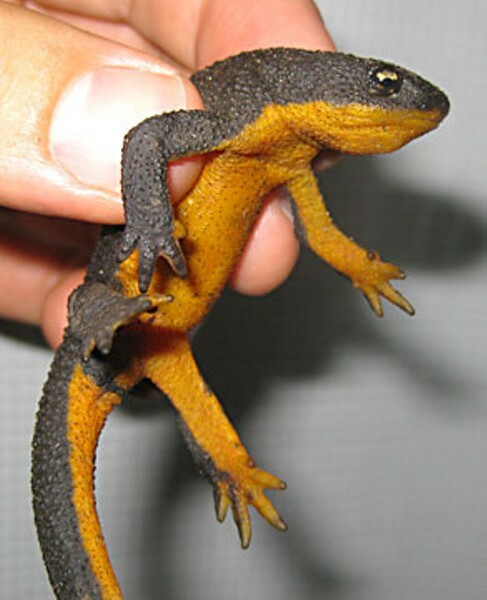 Salamanders with drier skin are called newts. 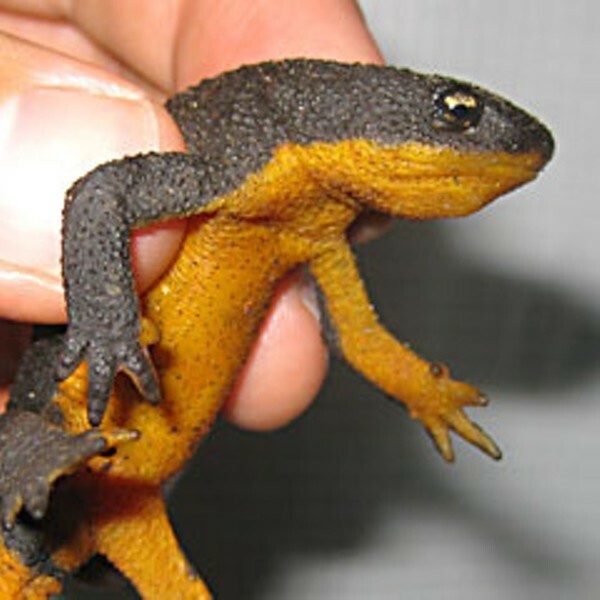 The Rough-skinned Newt (photo), ranging from Santa Cruz to Alaska, has a particularly toxic skin. If ingested, it can paralyze and kill several humans. That "tetrodotoxin" also occurs in Pufferfish and Blue-ringed Octopuses. In those marine animals, at least, the toxin is produced by symbiotic bacteria. Garter Snakes have evolved an immunity to tetrodotoxin. It is clear that predation has driven newts to become increasingly toxic, and snakes to become increasingly immune. It's an example of co-evolution and a natural arms race. Moreover, after eating a newt, toxin resides in a snake's liver for weeks, undoubtedly affording it some protection from birds. On Vancouver Island, newts and snakes have avoided the chemical arms race. Canada is just more peace-loving. An insight into speciation is provided by lungless Ensatina Salamanders, whose young, hatched from eggs under damp wood, resemble tiny adults. 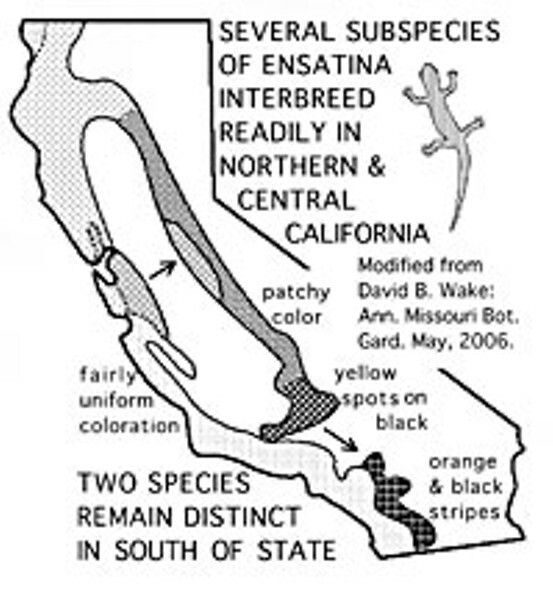 Several sub-species range southward on both sides of the Central Valley (map). Neighboring sub-species readily interbreed and blend, except those at the southern extreme of the range. These remain distinct because their hybrids have reduced vigor. Biologists consider the southern-end members to represent two different species. Another example of a "ring species," demonstrating the gradual origin of species by increasing geographic separation, is provided by sea gulls: Gradual changes through 360 degrees around the Arctic Ocean culminate in two distinct species in northern Europe. Be kind to salamanders -- our ancestors resembled them just 360 million years ago. I thank Prof. Sharyn Marks of H.S.U. for correcting my errors.